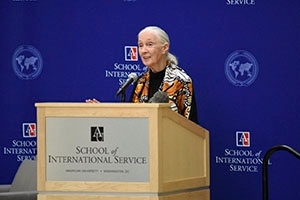 On Tuesday, March 28—just shy of her 83rd birthday and hours after President Trump signed an executive order reversing the US’s approach to climate change—world-renowned ethologist and conservationist Dr. Jane Goodall, DBE, founder of the Jane Goodall Institute and UN Messenger of Peace, delivered a lecture of hope, peace, and call for conservation action at the School of International Service (SIS). Following her lecture, Goodall participated in a candid fireside chat with Brian Sheth, chairman of Global Wildlife Conservation and co-founder and president of Vista Equity Partners. Known for her groundbreaking scientific work studying the behavior of chimpanzees in Tanzania’s Gombe Stream National Park beginning in 1960, Goodall also is a tireless activist and conservationist who, in her ninth decade, travels 300 days of the year to spread her message of respect for all living things. “We must learn to live in peace and harmony with each other, with people from different nations, with people from different cultures, people from different religions, immigrants. We must learn to live in peace and harmony with the natural world,” Goodall said in her lecture. Goodall discussed her early childhood love of animals—admitting to a crowded SIS Atrium that as a toddler, she once took a fistful of earthworms to bed with her, and a few years later, hid in a hen house for hours to see how hens lay eggs. She moved on to describe what it was like to be a young, inexperienced woman living in an African forest and breaking into the sciences under the guidance of paleoanthropologist and archaeologist Louis Leakey. “When I was first sent to Gombe National Park, I didn’t have any college degree. Leakey never came—he just sent me off—and I had to find out for myself how to study chimpanzees because nobody had ever done it,” she said. Despite her unconventional route of naming, rather than numbering, the animals she studied, Goodall became a respected scientist after discovering that chimpanzees make and use tools. However, Goodall recalled in her lecture the moment she went from being a scientist to an activist. It was 1986, and she was at a science convention during which she saw images and heard stories of wildlife destruction and watched secret video footage of chimpanzees, “our closest living relatives,” being mistreated in the name of science. “Scientists were so thrilled with the biological similarities between us and them…but they were not prepared to admit the equally striking behavioral and emotional similarities. When I saw that secretly filmed video, I couldn’t sleep for nights. When I went to that conference, I was a scientist…when I left I was an activist,” she said. Since then, Goodall hasn’t stayed put in one place for more than three weeks in her effort to communicate the need to respect and protect the planet and all its creatures. In the fireside chat with Sheth—a friend of Goodall’s and fellow conservationist—that followed her lecture, the two joked about the boundless energy that Goodall possesses which allows her to make a continued high impact. When asked by Sheth and SIS students about her international conservation observations, she described extensively the importance of investing in youth around the world to become champions for environmental issues. While she’s accomplished much in her career, her worldwide youth program Roots & Shoots, which brings young people together to design environmental projects, “has been a major factor in raising awareness and changing attitudes” about conservation around the world. In her lecture, Goodall listed five sources of hope that personally motivate her to continue her life’s work: the energy and passion of young people, the human brain, the resilience of nature, social media, and the human spirit.